I have been baking bread for over 6 years now. I started in 2001, my last semester at Grinnell College, with the hopes of producing some bread like I fell in love with in Germany. I started off with fairly simple recipes from a Fleischmann’s baking book my mom gave me. That book got me going pretty well. There were some very obvious failures, but I enjoyed the pursuit, and usually, the results. You don’t have to buy yeast! My first few attempts at sourdough were not that great either, and at some point I gave up. But after a break, I started up again in 2004, and I have had quite a bit of success since then. In the summer of 2004 I actually began using two different starters. I created my own wheat starter, which only takes about a week, and I also got some rye starter from a professor in the German department. One of the mistakes I had made in 2003 was keeping the starter in the freezer. The freezer is too cold for yeast, and basically kills the yeast. If you are going to wait more than a couple days between using your starter, keep in the fridge. It keeps for several months. It might start looking a little funky on top, but you can always just get rid of that part. 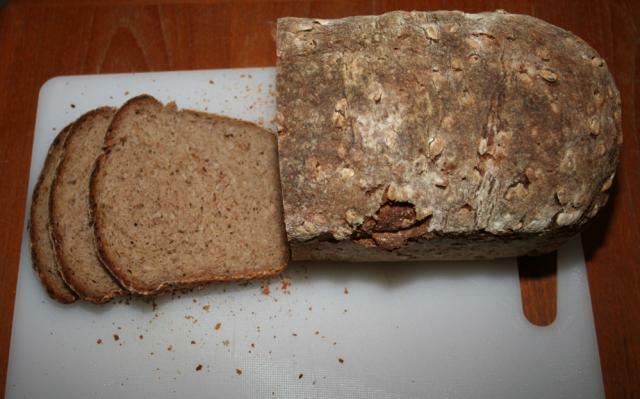 While I was in Germany last year for 5 weeks, my roommate actually thought my rye starter had gone bad, and threw it out. 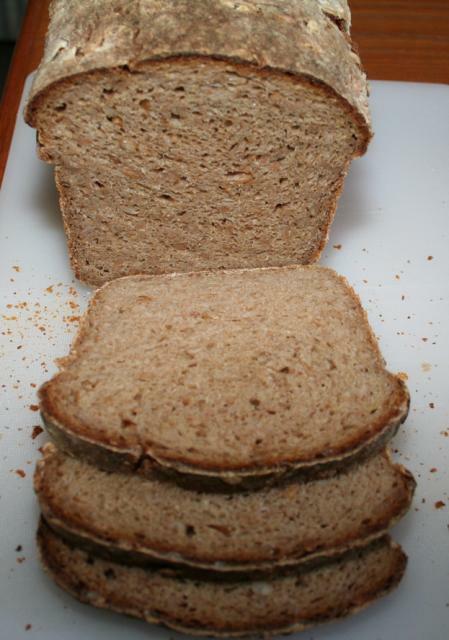 I was quite angry about that, but I ended up just taking the wheat starter, and refreshing it with rye flour, and that worked fine. So now I am back to two nice starters. I mixed the dough up around 10 a.m. It took a lot of kneading, as the spelt berries added a lot of water, and the dough did not want to really get very firm. After a good 10-15 minutes of kneading, I called it good. Then I let it rise. And rise. It was rising very slowly for some reason. It could be that the starter was not very active. Sourdough is as much of an art as a science. According to Joe Ortiz, in The Village Baker, one should think of making sourdough bread not as forcing the bread to rise, but guiding it. Kind of interesting. Through experience, one learns when the dough is ready to be baked, and so on. 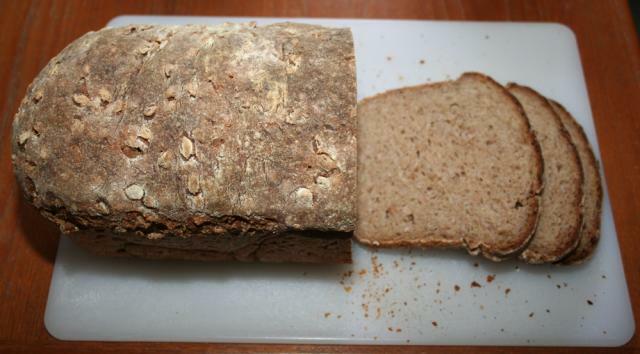 I punched down the dough around 6 p.m., shaped it into 3 loaves – one small, one medium, and one large. I always try to make the loaves equal-sized, but I usually end up with three different sizes. Oh well. Variety is the spice of life. I put the loaves in the oven around 10 p.m. I usually put them in at 425ºF and then turn it down to 400ºF, and bake them for an hour. The bread was well worth the wait. Clare and I have been enjoying it for over a week now. 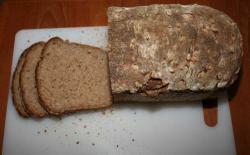 Usually the sourdough bread will stay good for about 2 weeks, depending on the heat and humidity. am in search of a preservation technique for a flat bread called chapathi (indian flat bread) we are hesitant to add any chemial preservation. our main preblem is the moisture inside the chapathi after cooking it in a hot plate is coming out when it is sealed in a plastic bag then that moisture is leading to a white colour fungus and our product is getting this fungus the very next day. we cant raise the production cost also. no yeast is used only whole wheat flour, water, salt and veg oil. the production and packing process is very fast that we cant give more time for cooling because it lead to the drying of the product. hope u will help us in this regard. regards !! quite beneficial post!